Capcom has another Street Fighter mashup title in the works, but the odds of it ever seeing Western shores are somewhere between "slim" and "it's never going to happen." Street Fighter X All Capcom is a newly-announced mobile title that, as its title would suggest, gathers Street Fighter characters like Ryu and Chun-Li, as well as other notable Capcom characters such as Mega Man, Asura and Frank West. Why exactly all these characters are being brought together remains a mystery, though this is certainly not Capcom's first attempt at a crossover. Most frequently these efforts have resulted in fighting games (ex: Street Fighter X Tekken and the Marvel Vs Capcom games), but given the mobile exclusivity Street Fighter X All Capcom is saddled with, we'd more likely expect to see the game in a genre less reliant on accurate button taps and twitch reflexes. Perhaps something like the recent Project X Zone, a 3DS roleplaying title that gathers famous faces from Sega, Namco Bandai and Capcom, and allows them all to throw down in relatively traditional, turn-based fashion. We could be totally off-base with this theory, but since Capcom must be aware of the shortcomings of mobile devices when it comes to fighting games, we're almost certain that Street Fighter X All Capcom won't be a virtual kumite. On the other hand, this may very well be a simple electronic card game. 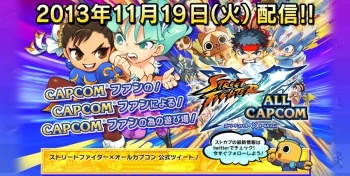 The official Japanese website for Street Fighter X All Capcom features a few tiny screenshots toward the bottom that appear to depict various Capcom personalities in card form. Long-time fans will note that many Capcom characters have already been adapted for card games, via the Capcom Vs SNK: Card Fighter's Clash franchise. Sadly, this game will probably never leave Japan. The Japanese have far more affection for mobile culture than Americans or Europeans, and there's very little chance that an English localization of Street Fighter X All Capcom could prove lucrative. The demographic of people who both play mobile titles and would be interested in something like Street Fighter X All Capcom is simply lacking in the West. Sorry to get your hopes up.